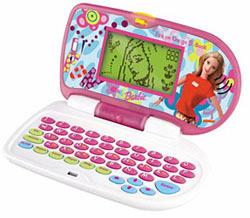 Lots of games and activities are packed into this mini laptop that's pure Barbie with its pink cover and pastel keyboard. The 6-by-3-inch electronic toy computer offers tons of games with a learning focus. There are eight different word activities (e.g., hangman, word scramble, spelling), five math activities (e.g., adding, subtracting, numerical ordering), four logic activities (e.g., pattern sequences, matching, memory), several music activities and games, and a handy calculator. Even better, this small, portable device can entertain a 5- to 10-year-old for hours and teach them something along the way. It will also give kids the chance to feel like a grownup working on the computer. This Barbie toy with substance will be a hit with the technically savvy younger set. Barbie compact learning computer goes everywhere. It can interact directly with children using digital sound.